News of Innovative Securities - How to spot fake investment promises? Every now and then companies surface and offer investments with guaranteed high returns, around 20-24% per year. What’s more, they say they’re able to do this on a monthly basis, with a return around 2%. The promise is simple: they pay future returns in advance. But is it possible to have such a solution in the real world? Analyst believe (like CNN Money’s expert) that such high yields can’t be guaranteed. Why? Because any return above the main interest rate of developed countries are impossible to promise. To put it another way: guaranteed returns can exist, but they can only reach the range of the interest rate of a developed country. That rate is now globally around 0-2% per year. This means that this is the highest return that can be guaranteed, anything above that can only be reached with risk-taking. This is a basic investment truth, but below you can read our detailed explanation of the reasons. Today’s market environment is simply not capable of yielding such high returns without risks. The reason is simple. Interest rates of central banks define all other rates in a country. In developed countries, interest rates are now around 0-2%. It’s rather hard to guarantee anything higher than that. Why? Because government bonds are the safest type of investments. The returns of these are heavily influenced by the interest rates mentioned above. If rates are low, so are returns: lately the bonds of developed countries pay between 0-2% yearly. Not monthly. In the meanwhile, the government bonds of less stable countries are still close to being guaranteed. Russian bonds, for example, pay 7.25% yearly, which is still far from the aforementioned 20-24%. The return of a Russian bond is as sure as it can be, but still, the country has higher risks than Western countries (that’s why it pays more). This doesn’t mean that high returns aren’t possible. Instead of safe bonds, one can choose stocks as investment. They can indeed have high returns. The S&P500 for example had the time of its life in the last years. It yielded a two-digit return between 2016 and 2018. Historically speaking, the best indices can reach a return around 10%, which is still far away from the 20+ range. What’s more, even the best investors (the likes of Warren Buffet) are only reaching returns between 10-20% on the long-term. But they also have serious company ownerships and dividends, which are accumulated in their success. The stock market also has its own ups and downs. Markets are moving constantly: there are times (summer and the holidays for example) every year when people sell stocks, and there are times of buying. This influences the market: prices change during these times. This makes it rather hard to guarantee a return every month. It’s against the logic of the market. Let’s also see the topic of risks. A stock is basically a piece of a company, and trustworthy companies never guarantee an exact rate of growth or income. Why? Because it’s impossible for them to do so. They have expectations and wishes that influence their prices. A corporation can have a bad quarter, or lower than expected sales, and then its stocks will fall. Even giants must face this: if Apple report lower iPhone sales than expected, their stocks fall, and even Volkswagen can lose 30% of its market value in weeks. What’s more, there are market corrections, too. This year, for example, S&P500 (and the whole stock market) fell for months constantly. This wasn’t unexpected, what’s more, we have been waiting for it for a while now. Still, it shows the risks involved in stock investment, and also how hard it is to offer a guaranteed return every month. And when a crisis comes, effects can be even direr. During the financial crisis of 2008, some shares fell between 20-60%, mostly unexpectedly. These are risks that can’t be ignored, and it makes guaranteed returns close to impossible. On the long term, prices tend to hike back, that’s why rich invest mostly in stocks, but these fluctuations make monthly calculated returns impossible. Does this mean that we must settle for low returns? No, absolutely not. But as conscious investors we have learned to accept the truth of all investment: higher returns mean higher risks. This truth applies to amateurs, professionals and financial services, too. Briefly, it’s possible to reach high returns with aggressive investment strategies, but there will be risks and no guarantees involved. 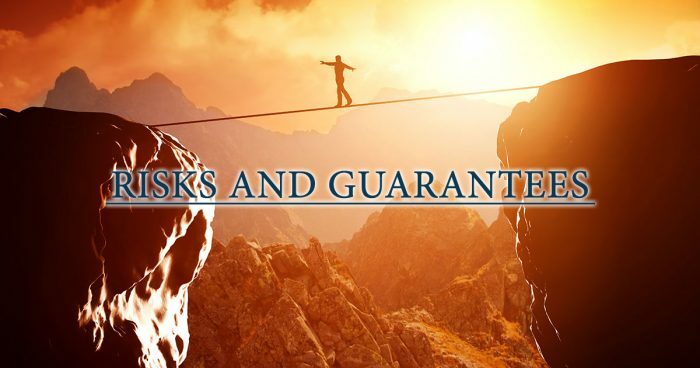 We can also choose balanced portfolios that have safe and riskier instruments with lower and higher returns respectively. And as we’re getting closer to retirement, we should leave these risky solutions behind and settle for safer investments with smaller returns. When we’re choosing an investment solution or portfolio, we shouldn’t look for dream-like numbers and unfounded guarantees, but for honesty. Even when talking about the risks. Every solution should disclose the risks and expected (not guaranteed) returns in the description of said portfolio. And if something seems too good to be true, it probably is. This is especially important in Eastern European and Baltic territories, where new Ponzi schemes are unveiled every year.